It's time for another round of The Caption, which, we're told, ran in a Detroit-area newspaper in 1987: "Kirk Gibson ever so firmly yet passionately rubs up and down and up and down and up and down on his favorite bat, Betty My Beauty, more than 750 times at varying speeds but in an almost identical motion Thursday before the Tigers beat the White Sox, which, coincidentally, is what Gibson used to clean up the mess from his bat-rubbing session." 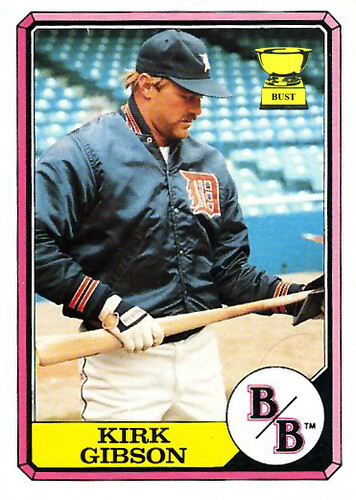 That bat-rubbing session must have gone on a real long time - another image from that session was used on his 1987 Topps base card. Just some "collector's set" of about 30 cards sold complete in a playing card-type box. Boardwalk and Baseball was a baseball-themed theme park in Florida on I-4, about halfway between Orlando and Tampa. It included a ballpark, and the Kansas City Royals held their Spring Training there for a few years. The place closed around 1990, and the site is now a shopping mall.